* Annual estimated passenger usage based on sales of tickets in stated financial year(s) which end or originate at Gunnislake from Office of Rail and Road statistics. Methodology may vary year on year. 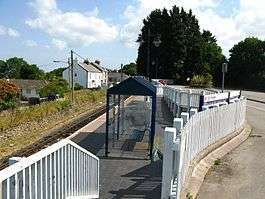 Gunnislake railway station serves the village of Gunnislake in Cornwall, England. There are also connecting buses from here to the town of Tavistock. However the station is located in or nearer to the villages of Drakewalls and Albaston. It is the northern terminus of the Tamar Valley Line from Plymouth. A view of the station in 1972. The 3 ft 6 in (1,067 mm) gauge East Cornwall Mineral Railway was opened from the quay at Calstock to Kelly Bray on 8 May 1872. It was replaced by the present Plymouth, Devonport and South Western Junction Railway route across Calstock Viaduct on 2 March 1908 which saw passenger trains introduced. Gunnislake became a terminus on 7 November 1966, the line onwards to Callington having closed the previous Saturday. The original station was on the west side of the road bridge but in 1994 it was replaced by a new station on the east (Calstock) side which has allowed the low (12 feet – 3.6m) bridge to be demolished. There is a single platform – on the left of trains arriving from Plymouth. The station car park and bus interchange is situated immediately behind the platform. Gunnislake is the terminus of Tamar Valley Line trains from Plymouth, which is typically a 45-minute journey. During the summer of 2015 nine trains each way operate on weekdays, eight on Saturdays and five on Sundays. Connections with main line services can be made at Plymouth. Six pubs in Gunnislake take part in the Tamar Valley Line rail ale trail, which is designed to promote the use of the line. The line is also part of the Dartmoor Sunday Rover network, with buses to Tavistock and Kit Hill meeting trains at Gunnislake. ↑ "139: Plymouth - Gunnislake" (PDF). National Rrail. Retrieved 2015-06-10. Wikimedia Commons has media related to Gunnislake railway station. Crombleholme, Roger; Gibson, Bryan; Stickey, Douglas; Whetmath, CFD (1985) . Callington Railways. Bracknell: Forge Books. ISBN 0904662233.